Three crew members are orbiting Earth getting ready to dock to the International Space Station early Friday in their Soyuz TMA-18M spacecraft. Meanwhile, the six residents on the orbital laboratory are exploring human research and maintaining life support systems. 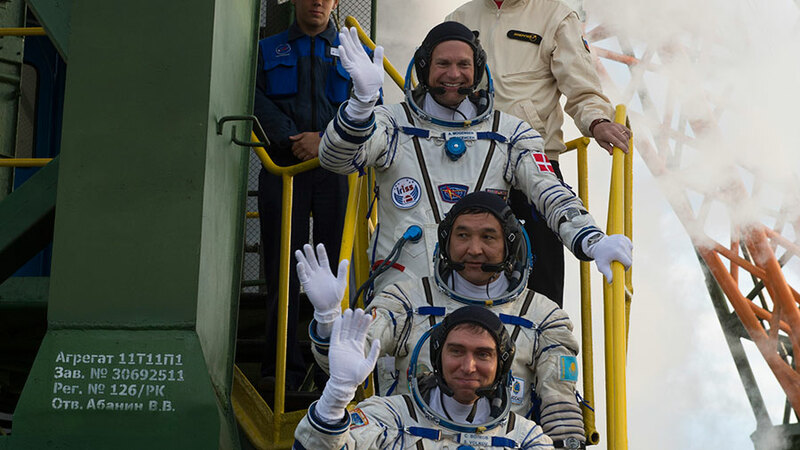 Soyuz Commander Sergey Volkov and first-time space flyers Andreas Mogensen from Denmark and Aidyn Aimbetov from Kazakhstan launched today at 12:37 a.m. EDT beginning a two-day trip to the space station’s Poisk module. Volkov will stay in space till March. Mogensen and Aimbetov will return home Sept. 11 with record-setting cosmonaut Gennady Padalka in the older Soyuz TMA-16M spaceship. Long-term microgravity research is the station’s primary mission as scientists and astronauts learn to live in space for extended periods. A pair of One-Year Crew members, Scott Kelly and Mikhail Kornienko, studied how microgravity affects a crew member’s ability to perform specific tasks as well as fatigue due to disruption of a normal sunrise/sunset schedule. Japanese astronaut Kimiya Yui worked on science hardware as he reconfigured the Cell Biology Experiment Facility inside the Kibo laboratory module. NASA astronaut Kjell Lindgren participated in an experiment exploring techniques for monitoring a crew member’s pulmonary system.